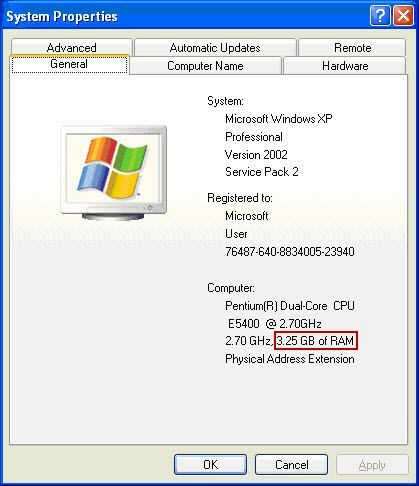 In 32bit OS system, you can only use 3.25G RAM even your PC has 4G RAM. It's the 32bit system's limitation. The system can only recognize the 3.25G RAM and we call the rest memory as "Unmanaged Memory" (Figure 1-1). There is about 750M memory is waste. In CCBoot system, we can use the unmanaged memory for client write cache. 1) The client PC should have 4G or more RAM. 2) Not all motherboards support this function. If there is option named "memory mapping hole" in BIOS, please enable it. 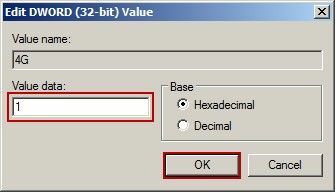 3) This function is only valid in 32bit system. Cannot use it in 64bit system. 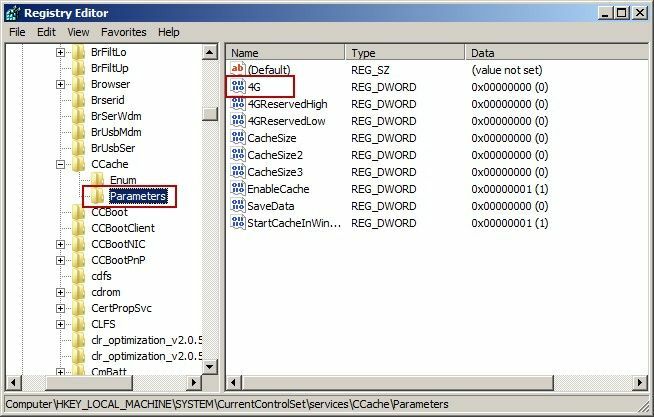 4) If you are using Windows 7 32bit OS, you need to run "cmd -> bcdedit /set PAE ForceEnable" with administrator permission to enable large memory access. For example, PC101 has 4G RAM. 1) Enable super client in PC101 properties in CCBoot server. 2) Diskless boot PC101, click "Start" menu -> "Run" -> input "regedit", press "Enter" key. 4) On the right list, double click "4G" (Figure 1‑2). 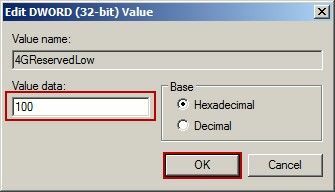 5) In popup "Edit DWORD(32-bit) Value" Dialog box, input "1" in "Value data", click "OK" (Figure 1‑3). 6) In the right list, double click "4GReservedLow", in the popup "Edit DWORD(32-bit) Value" dialog box, input "100" in the "Value data", click "OK" (Figure 1‑4). 8) Shutdown the client PC and disable super client in the PC101 properties.